data transmission for Layer-2 Ethernet connectivity. ETX-1300 from RAD introduces a robust, carrier class design with redundant extractable power supplies, external alarm port and clock interfaces for input or output clock synchronization. • 32 Fast Ethernet ports with fiber optic SFP or UTP connectors. ETX-1300 includes an internal bridge, operating in VLAN-aware and VLANunaware modes. VLAN stacking can be used for traffic separation between different users or services, by defining a service provider VLAN ID per customer or service. When VLAN stacking is used, a service provider VLAN tag is added to the user traffic and removed from network traffic. Both service provider VLAN ID and service provider VLAN priority can be defined. Policing and classification of the traffic flows are performed between any ingress and any egress Ethernet port of the device. ETX-1300 monitors traffic with specified flow parameters, allocates bandwidth, forwards traffic to different queues according to classification parameters etc. RAD's ETX-1300 supports link level OAM per IEEE 802.3ah enabling link management including OAM discovery, link monitoring, remote fault detection, and remote loopback control operations. 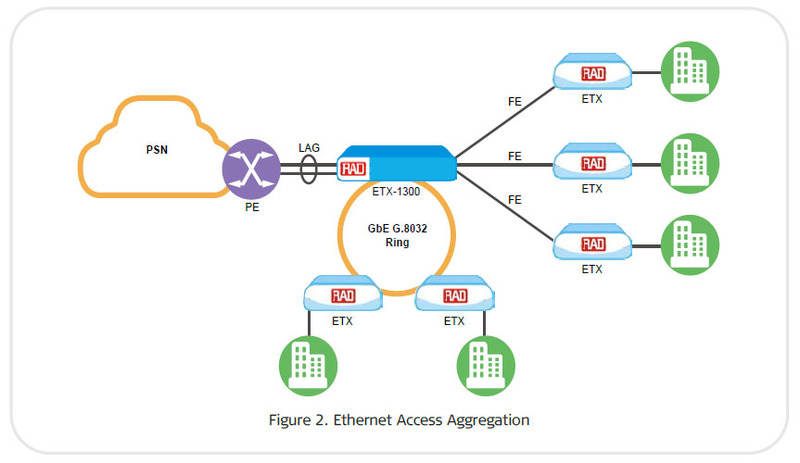 ETX-1300 Traffic Management User traffic can be queued and prioritized according to VLAN priority and ToS/Diffserv. When equipped with a removable MiRICi-E3T3 module (ver. 2.5), a fiber FE port can operate as an E3 or T3 port, forwarding LAN packets to TDM-based WAN. When operating in the T3 mode, MiRICi-E3T3 modules are fully controllable via ETX-1300 management application. Note: ETX-1300 equipped with the AC or 48 power supply modules supports up to 16 MiRICi-E3T3 units. When equipped with two high-power ACHP or 48HP power supply modules, ETX-1300 can host up to 32 MiRICi-E3T3 units. Link aggregation is performed as per 802.3ad (with or without LACP). This enables operators to use up to four Ethernet links as a single virtual interface, sharing traffic load and providing link resiliency. Ethernet Ring Protection technology per G.8032 provides resilient network connection over ring architecture and rapid service restoration. • External station clock source via station clock port, providing out-of-band synchronization. • Remote inband management via the GbE or FE interface. Remote management is performed using Telnet or RADview, RAD’s SNMP-based EMS. Software download is available via local terminal using XMODEM/YMODEM, or remotely using TFTP/FTP. ETX-1300 uses the Syslog protocol to generate and transport event notifications over IP networks to the central Syslog server. The Syslog operation complies with the RFC 3164 requirements. Comprehensive monitoring and diagnostic capabilities include port status indication and statistic counters for Gigabit Ethernet interfaces. The RAD ETX-1300 includes a dry-contact connector for reporting alarms to external equipment. The connector also has an external alarm input for monitoring external sensors. For diagnostic purposes, ETX-1300 maintains a cyclic event log file that stores up to 2048 time-stamped events and a real-time current alarm list. are visible via the local terminal.